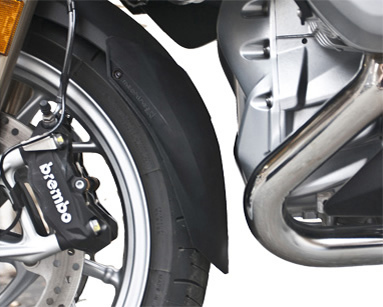 The front fender of the 2014~2018 liquid cooled R1200RT is short exposing much of the silver painted front engine cover to rocks, tar, and debris thrown back by the front tire. The Avant 12RT_LC design adds 6" of extra front fender length and 2" more width than the stock fender to effectively reduce mud, water, tar, and rock splash back onto the engine, pipes, and surrounding components. The Avant RT_LC helps protect the engine surfaces and keep them looking new longer. A key feature of the whole Avant line is ease of installation with no hole drilling required in your brand new purchase. It is simple to install and looks beautifully integrated with the styling of the new RT. The Avant fits over the top of the stock RT fender and engages the trailing end with a unique molded-in saddle. Two stainless steel compression clamps grip the underside of the stock fender on two sides, drawn tight with T25 Torx Head screws. Avant RT_LC are injection molded in resilient polypropylene with a surface texture that matches the RT fender. The characteristic flared wing shape widens the splash coverage area without looking wide. It fits perfectly.